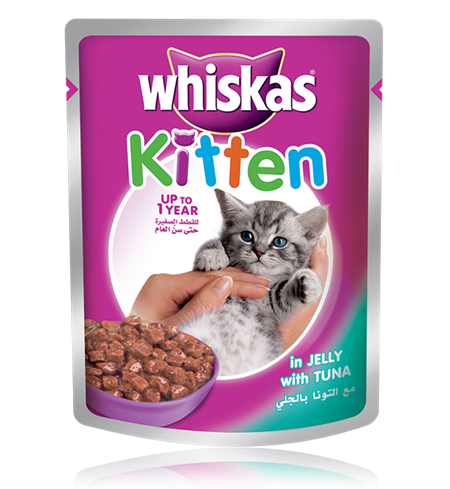 Each pouch contains gently cooked, succulent chunks of meat, carefully prepared with all the essential nutrients your little one needs to help her grow big and strong. Gelling agents (Guar gum, Cassia gum, Kappa carageenan, Water) 46.38%, Animal origin material (Tuna red meat) 45.97%, Soy bean oil 6.60%, Vitamins and minerals 1.05%. 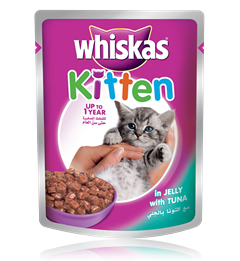 Whiskas® Kitten pouch with Tuna in Jelly is formulated to meet the nutritional levels established by the AAFCO cat food nutrient profiles for growth and maintenance. Weaning 2 months - 4 months (3-4 Pouches/day), 5-12 months (4-5 Pouches/day). You can increase or decrease the daily amount according to your cat’s activity level. Crude Fat 5.0 % min, Crude Protein 9.0 % min, Crude Fibre 1.0% max, Moisture 83.0% max.